The Bosch GPL5 Laser level is a lightweight, extremely portable layout tool that packs a lot of features in a small size. It shoots a bright laser line across 5 points, making it ideal for just about any indoor layout task. With premium extras like a self-locking laser pendulum and multiple mounting points, the Bosch GPL5 Laser level is versatile enough for nearly any job. Whether you’re tackling a home improvement project or you’re a professional who needs a laser level that will fit into your tool belt, the Bosch GPL5 Laser level is an excellent choice. The best aspect of this Bosch Laser level is its small size. 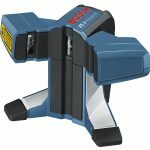 Compact enough to tuck into a tool belt, this laser leveler is great for extended set ups as well as being a convenient way to check your work. Even with the Bosch GPL5 Laser level’s small size, it still has enough features to make it a great laser for even the toughest jobs. One of those features is the ability to shoot a plumb line, 90-degree angle, and horizontal and vertical layout lines all at the same time. That makes the Bosch GPL5 Laser level flexible enough to handle a wide variety of layout tasks, from installing trim to laying out doors and windows. You’ll never run out of new ways to use this laser level. Another great addition to this Bosch Laser level is its self-locking pendulum. In order to level itself, the laser emitter is mounted on a steel pendulum that automatically adjusts in order to shoot a perfectly level line. Some other laser levels allow the pendulum to float even when it’s not in use, so transporting the level can throw off calibration. The Bosch GPL5 Laser level, like more expensive laser levelers, clamps down on the pendulum when the laser is off, so you’ll need to calibrate the level less frequently, which means you save time and effort. Finally, the Bosch GPL5 Laser level boasts an incredible 50 hours of continuous use out of the three AA batteries that power this tool. Its battery life is unparalleled in laser levels in the same price range, so if you’re planning on using a laser leveler every day, the Bosch GPL5 Laser level is an excellent choice. There are a few downsides to the Bosch GPL5 Laser level however, and one of the most glaring is its included mounting hardware. While the Bosch GPL5 Laser level has reference lines so it’s easy to put in the right place, if you need to mount the level to a wall you’re going to need to find a different level. 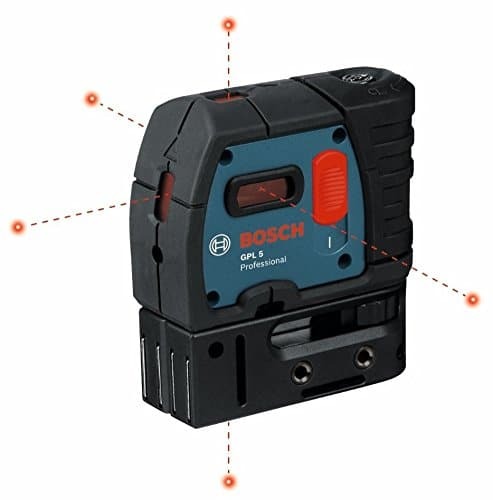 It does feature a magnetic mount for ease of use on steel, but in general the Bosch GPL5 Laser level is best used when placed on the ground or with the addition of a tripod. Another shortcoming of the Bosch GPL5 Laser level is its brightness. Compared to other laser levels in the same category, it has a weaker beam. This is only a problem in direct sunlight, so if you’re planning on using the Bosch GPL5 Laser level indoors then it won’t be an issue. 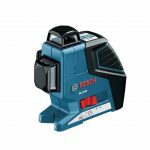 Bosch does make a brighter laser leveler, the GII3-80, but in order to get a brighter beam you’ll need to make a trade off in size, since the GII3-80 is quite a bit larger and less portable. A direct upgrade to the Bosch GPL3, the GPL5 adds in another two beams and improves on the brightness an optics while still retaining the small size. This means that, if you want a compact laser level that you can easily carry with you, the Bosch GPL5 Laser level is one of the very best. There is a trade off in brightness when compared to larger models, and the mounting hardware is slightly awkward, but at the end of the day there isn’t another laser level in the same price range that packs all of the features of the Bosch GPL5 Laser level into the same small size. If portability is your main concern, this is the laser level for you.